The following is a guest review from my husband. This is one impressive book. 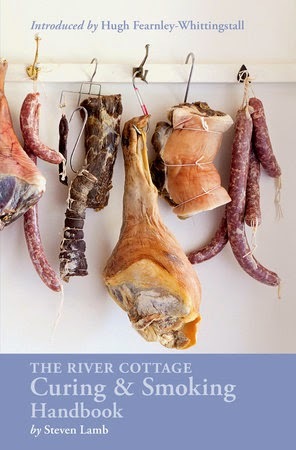 I highly recommend The River Cottage Curing & Smoking Handbook for anyone even remotely interested in curing and smoking. This is a small book but it is packed with a wealth of knowledge. This book would be all you need to get started in smoking and curing meats and would be a valuable resource for the pro. They break down the process into all of its steps, ingredients and equipment and explain in detail why things are done a certain way. There is a write up on the different types of salt that can be used explaining the benefits and drawbacks of each. There are tables giving quick reference on subjects like smoke favors imparted by different woods, cured products and where they come from, rub flavoring, marinade flavoring and brine concentrations. There are plenty of recipes and descriptive photos that make the process clear and easy to follow. This book even packs in a section on butchering, teaching techniques required to complete the recipes contained in the book. I was so impressed with this book I will probably get others from River Cottage. Disclaimer: This book was provided by Blogging For Books. All opinions stated here are my own or from my family.